Green means go for shoppers seeking fish caught in the wild in sustainable and responsible ways, while a red stamp means stop buying (and selling) unsustainably caught fish. A new project launched today by natural foods chain Whole Foods, in partnership with the Monterey Bay Aquarium and the Blue Ocean Institute, will put a green, yellow or red sticker on all of its wild-caught seafood indicating how sustainable are the supplies and fishing methods for each fish stocked in the cooler. Green stickers mean the fish for sale is a relatively abundant species and is caught in ways that are environmentally friendly and able to keep the stock of those fish plentify. Yellow stickers mean there are still some concerns with how plentiful the fish stocks are, as well as with methods used to catch them. Red stickers mean that the fish is currently suffering from overfishing or that current fishing methods are harming other marine species or habitats. As part of the kickoff of the labels, Whole Foods says it plans to phase out any red-labeled fish species by Earth Day 2013, while setting incremental benchmarks for phasing out red-labeled species by Earth Days in 2012 and 2011. Whole Foods developed the new rating -- which follows on years of efforts to improve the sustainability of its seafood counter -- in partnership with the Blue Ocean Institute and Monterey Bay Aquarium. Both groups have developed widely respected science-based seafood programs, and each evaluates species and fishing fleets. A sample chart explaining the ratings is at right; click on the image for a larger version. "Our rankings represent authoritative science that examines the key factors affecting the health of ocean populations. 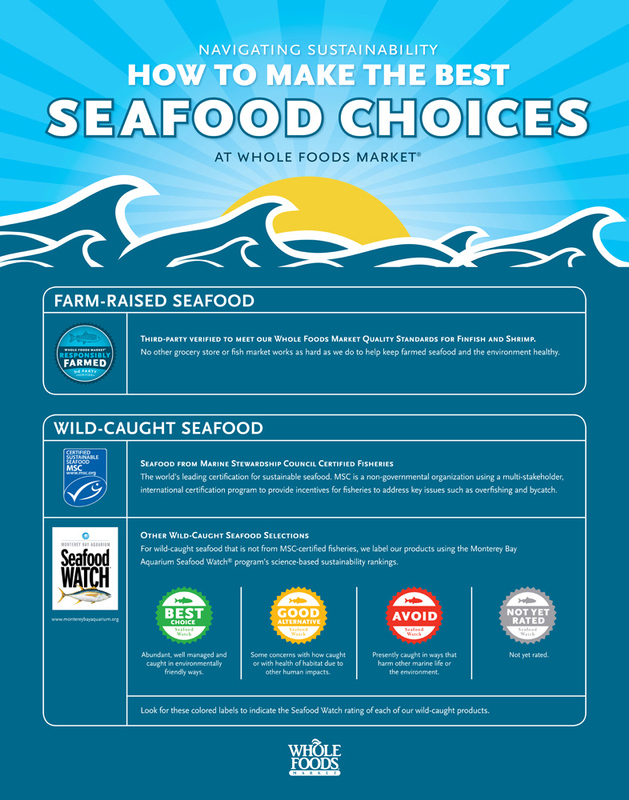 The rankings on the Whole Foods Market signs reflect the efforts of seafood science experts," Carl Safina, Blue Ocean Institute founder, said in a statement. "Each also represents information consumers can understand and trust. This partnership will give seafood lovers the tools they need, where they need them -- at the seafood counter -- to make informed choices on behalf of ocean-friendly seafood." Whole Foods has been working on seafood sustainability since 1999, when it partnered with the Marine Stewardship Council; today's new rankings apply only to fish that aren't already certified by the MSC. In 2007, the company created standards for farmed fish, which it updated in 2008. Its efforts landed the company at the top of Greenpeace's seafood sustainability scorecard when it was first launched, though in the latest release of the scorecard, Whole Foods is in third place, behind Wegman's and Target.